Graf, D.L. & K.S. Cummings. 2006. Palaeoheterodont Diversity (Mollusca: Trigonioida + Unionoida): what we know and what we wish we knew about freshwater mussel evolution. Zoological Journal of the Linnean Society 148: 343-394. Bieler, R., J.G. Carter, & E.V. Coan. 2010. Classification of bivalve families. pp. 113-133. [in] P. Bouchet & J.-P. Rocroi (eds.). Nomenclator of Bivalve Families. Malacologia 52(2): 1-184. Lopes-Lima et al. 2017. Phylogeny of the most species-rich freshwater bivalve family (Bivalvia: Unionida: Unionidae): Defining modern subfamilies and tribes. Molecular Phylogenetics and Evolution 106: 174-191. Bolotov et al. 2018. A new genus and tribe of freshwater mussel (Unionidae) from Southeast Asia. Scientific Reports 8: 10030 [12 pp.]. Graf, D.L. & K.S. Cummings. 2007. Review of the systematics and global diversity of freshwater mussel species (Bivalvia: Unionoida). Journal of Mollusca Studies 73: 291-314. This textual representation of the classification of the Unioinoida can also be depicted as a cladogram, shown below. 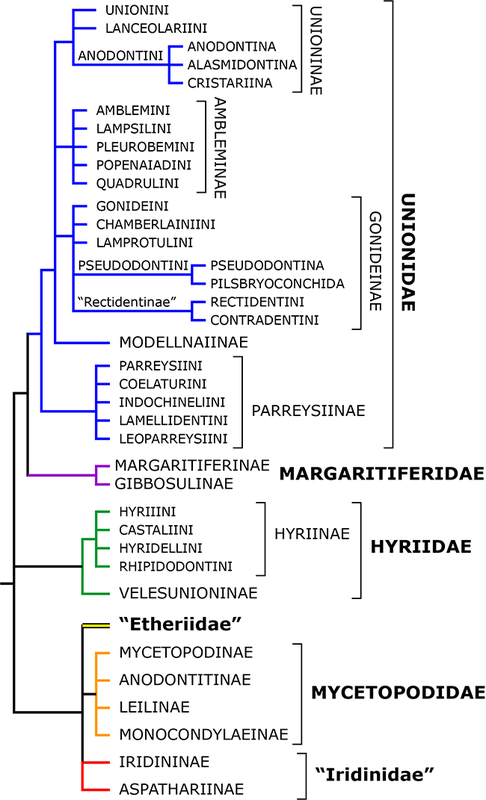 The phylogeny of the Unionoida is an area of active research. We expect that as more information in acquired and analyzed, our preferred classification will be further refined and improved.